Established in 1968, KidKraft is a well-known company that creates and manufactures dollhouses, play kitchens and many other toys for children. Basically, KidKraft could give Fisher Price a run for its money. 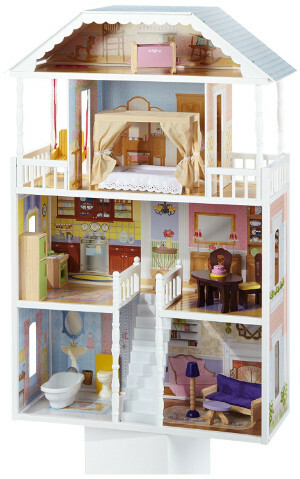 They make some of the best dollhouses that any girl, and even boys, would love to have and play with. Their wooden dollhouses are designed for ages 3 and older due to smaller, removable parts posing a choking hazard. Ideal starter dollhouses for your toddler can be found here. Kid Kraft models consist of a variety of sizes, shapes and designs from Victorian-style houses to modern ones. There are smaller dollhouses or ones that go up to four feet tall. Many of them can even hold 18” dolls. KidKraft has quite a few models available, so it might be hard to decide which one is best. We have reviewed 8 of the best KidKraft dollhouses to help you out. 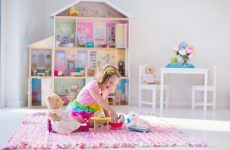 This uniquely designed KidKraft dollhouse will give your children hours of entertainment as they make believe with their dolls and rearrange the 35 furniture pieces and accessories in the eight rooms. The Majestic Mansion boasts four stories, has an elevator and even has a garage with doors that swing open. The Majestic Dollhouse is able to accommodate any doll up to 12″ tall and Barbie-sized dolls can fit as well. It measures about 52 x 14 x 53.5 inches, making it large enough to grow with your child and to allow many children to play around it. A constant best seller on Amazon with over 1,100 customer reviews and many happy kids around the globe loving this favorite. There’s no denying that the Majestic Mansion Dollhouse is impressive and comes with adorable furniture that any little girl would love. According to KidKraft, their Chelsea Doll Cottage is perfect for any young girl with a wild imagination. This dollhouse has a sweet vintage cottage vibe noticeable on the walls and in the décor. The Chelsea Cottage includes 17 pieces of furniture, two plastic staircases and windows that open and close. This dollhouse measures 24.5” x 13” x 28”. Despite some of the troubling negatives, this dollhouse still has really great reviews and a lot of children have reported being really fond of it. However, because of the flimsy wood reports, this dollhouse may be better for older children. Small toddlers and infants may not be gentle enough with it for it to last a long time. It is a great little dollhouse, though, especially if your space is limited. The furniture completely fills the house, which is a bonus and should be considered when looking at the cost. 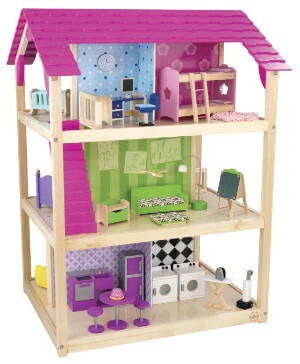 According to KidKraft dollhouse customer reviews, this is the best dollhouse for a 4-year-old. However, it is actually suitable for children aged between 36 months and 8 years. 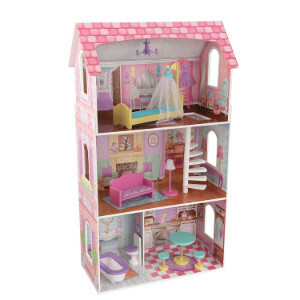 The dollhouse has a pretty pastel design and includes nine pieces of furniture. It measures 25.5x 13 x 44 inches and weighs 27.8 pounds. Although one of the negative aspects of this wooden dollhouse is that it is not sturdy, it is very durable, according to KidKraft dollhouse reviews. Also, the house comes with a fitting for you to attach it to the wall. This is great if you have younger children and worry the dollhouse may fall on them. Your children can use dolls and standard-size dollhouse furniture they already have in addition to the furniture provided, so there is no need for any further expense. 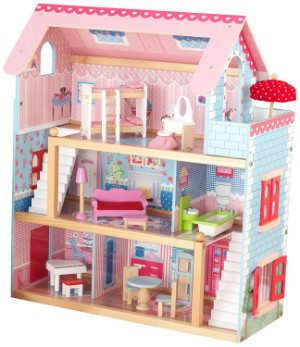 The KidKraft So Chic Dollhouse with Furniture is one of the top rated dollhouses currently available. It is split over three levels, has ten rooms for different play scenario and comes with 45 pieces of furniture. The dimensions of this dollhouse are 37.5 x 29.2 x 10.6 inches and it weighs 68.5 pounds. The size of this dollhouse is both a benefit and a disadvantage. On the one hand, you need a lot of floor space to accommodate this toy. On the other hand, there are more rooms than many other dollhouses and this gives more options for your child to use their imagination and have fun when playing. The dimensions are clearly stated, so just make sure you have the necessary amount of room before making a purchase. All the furniture you need is included and your child can use their Barbies or dolls of a similar size. Both the dollhouse and the furniture are made of wood and this means all components are sturdy and unlikely to break during normal play. The Savannah Dollhouse is a sophisticated mansion designed for children ages three and up. The dollhouse is decorated just like a southern mansion and is fully furnished. The furniture is beautiful and handcrafted. The dollhouse weighs approximately 40 pounds and measures 32.5 x 13.5 x 51-inches. It stands over four feet tall, making it a toy that will last for many years as your child grows. The Savannah Dollhouse certainly does look impressive with its large size that can accommodate Barbie-sized dolls and its southern décor. What it is really cool about this one is that it is larger than your average dollhouse. 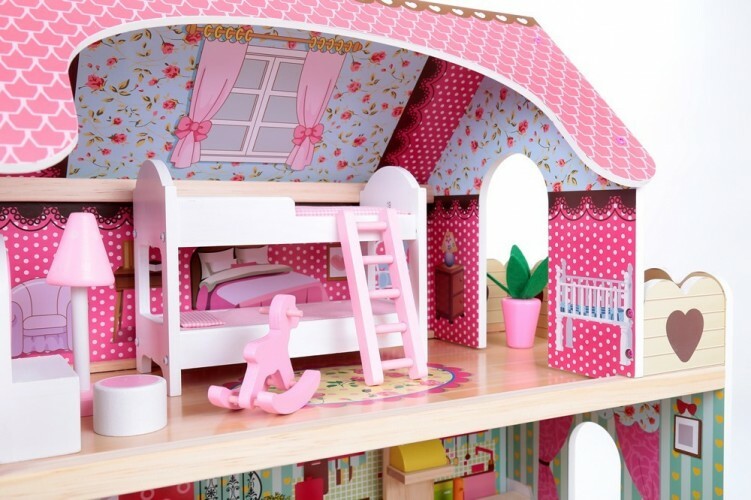 Little girls love the idea of the house feeling more life-size and having more space to play with. The furniture is elegant and well made with fabric and cushions. This is a really lovely dollhouse. Another of the best dollhouses in 2019 is the KidKraft My Dreamy Dollhouse with Furniture. In both appearance and style, this dollhouse is quite like the KidKraft Savannah Dollhouse. The Dreamy house is split over three levels and comes with 14 pieces of furniture. This is possibly the best dollhouse for a 3-year-old, although Kid Kraft state it is suitable for children aged between 36 months and 15 years. One of the great aspects of this particular dollhouse are the fun features. These include a gliding elevator, a piano that plays music and furniture that makes sounds. The dollhouse features working doors and two outdoor patios on the second and third-floor levels. As the Dreamy dollhouse comes with furniture, you do not need to buy any extras. However, if you do want some additional pieces, KidKraft Savannah Dollhouse replacement furniture fits perfectly. was a massive hit across the globe and many children are obsessed with any products relating to this movie. 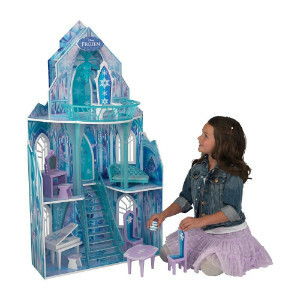 If your child is a big fan and also has a passion for playing with dolls, then the KidKraft Disney Frozen Ice Castle Dollhouse is potentially the perfect gift. The castle dollhouse has three floors, four rooms a balcony and 11 pieces of furniture. The dimensions of this product are 24.1 x 16.5 x 45.4 inches and it weighs 25.8 pounds. Overall, the Dollhouse reviews suggest that customers are delighted with this product and specifically identify the good quality of the materials used as a reason for this. The major downfall appears to be the time it takes to construct the Ice Castle, so take this into consideration if you are buying it as a gift for a special occasion. The size and design of this doll house are impressive and any child who loves Frozen will be delighted to receive this. 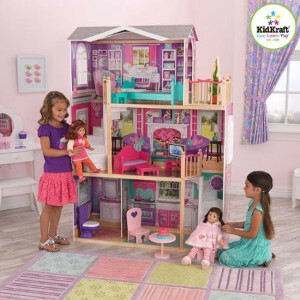 Split over three levels and with four rooms, the KidKraft 18” Doll Manor is one of the top-rated dollhouses and is the perfect gift for children of all ages. It comes with 12 jumbo-sized pieces of furniture that suit the large size of this dollhouse. The dimensions are 47.7 x 19.5 x 65.5 inches and it weighs 79.4 pounds. 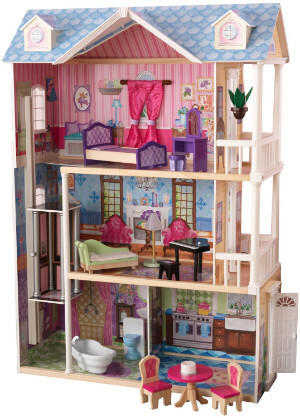 This is the first of the KidKraft dollhouses to accommodate dolls up to 18 inches. This means your child can choose to play with any dolls of their choice in this enormous dollhouse, including Barbie and American Girl dolls. If you have enough space to accommodate the large size of this manor, then its size is a bonus. Children will love the feeling of playing with something that is closer to life-size than many of the other ones available. The KidKraft dollhouse line-up is nothing short of impressive and with such a great range, there is enough variety to suit every taste. Based on parent reviews, children love Kid Kraft dollhouses! 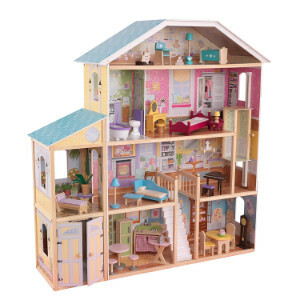 We hope you have found these KidKraft wooden dollhouse reviews helpful in your search for the right fit for your home. For people with a limited budget, the Chelsea Doll Cottage with Furniture is a good choice as it is reasonably priced while still offering hours of dollhouse fun for your child. Ideally, this is best suited to younger children as a first dollhouse. If you are prepared to spend a little more but do not want the most expensive one available, then the Savannah Dollhouse is a popular choice. Not only does it have many attractive features, but it also fits your child’s Barbies dolls. A great option for older children is the KidKraft Elegant 18” Manor. The larger size will appeal to them more and they can use many of the dolls they already have for endless hours of fun. The proportions will help them to let their imaginations run wild. The downside of this product is that it is only suitable for people with a large enough space to accommodate the dollhouse. In terms of buying the most impressive dollhouse for your child; there are two options. Either the Majestic Mansion Do or the Disney Frozen Ice Castle. The former is best suited to children who prefer a traditional style dollhouse, while the latter is a must for Disney or Frozen fans. Both are equally impressive in different ways and will delight any child who receives either of these as a gift. One of the biggest advantages of choosing any KidKraft dollhouse over its competitors is that each dollhouse comes complete with furniture. Kidkraft also sells dollhouse replacement furniture and accessories. This is an important consideration when choosing whether to purchase a Kid Kraft house or one from a competitor. So there you have some of KidKraft’s impressive range of popular and best-selling dollhouses. I’m sure your little ones will create some wonderful memories with any of them and be entertained for years to come.